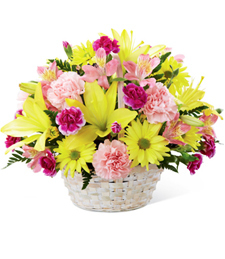 A whimsical and fanciful assortment of white, pink, red, purple, blue, yellow and orange daisies and carnations will send a loved one's heart soaring. 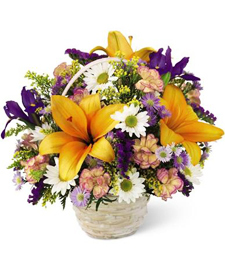 The Flights of Fancy Bouquet is a loving token of your warmest sentiments. 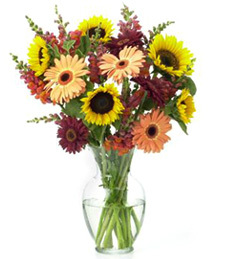 Convey beauty, patience, and simplicity with this warm and vibrant birthday bouquet of sunflowers and daisies. 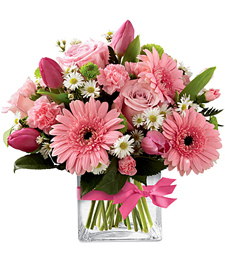 Just the perfect amount of delightful joy and tender sincerity�order today! 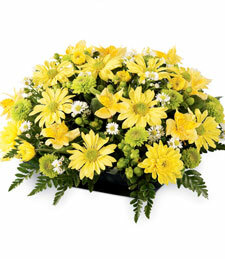 Embrace those lush lemon sentiments with a brilliant array of magnificent color! 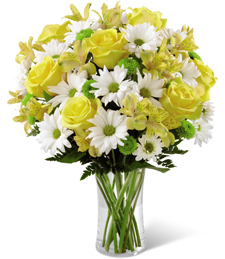 Sunkissed yellow and shimmering white ignite that little bit of Luscious Lemons just like grandma's home made lemonade in the summertime. 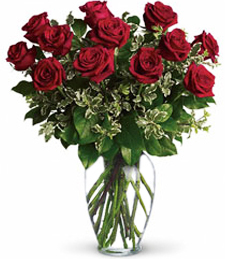 Liven up that special occasion with the perfect gift to invigorate the senses. 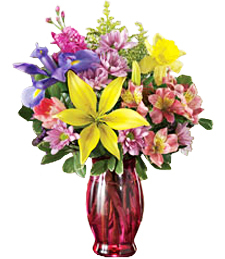 A vibrant kaleidoscope of captivating color, this exquisite array of flowers bursts with charismatic charm and vivacious beauty! 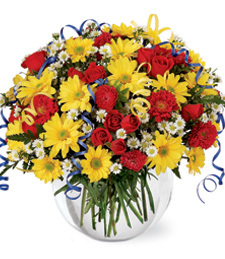 Sure to light up any room, these brilliant blooms make a spectacular gift! 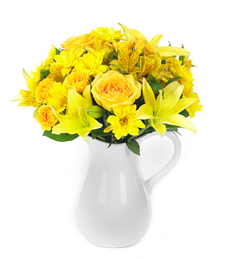 The Sunny Smiles of Life have arrived for the light of the sun is shining upon you! 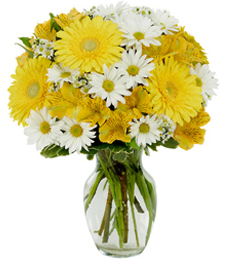 Release that warmth and good cheer for the color of yellow is for utter happiness and genuine frienships. Let the realm of positive energy flow through your life like a winding river of love. 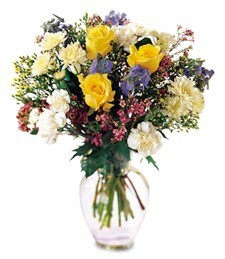 Give the gift of all yellow blossoms that shimmer with style for a simple thought of happiness go a long way! 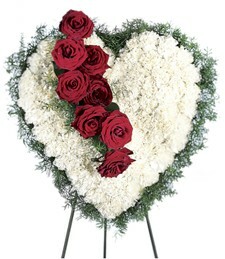 Huggable, loveable and vividly stunning! 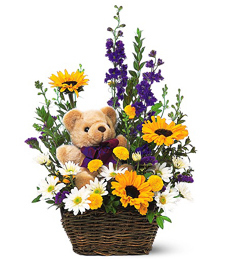 Lively, bright flowers in vivacious shades of purple, yellow and white burst with beauty and alluring vibrance while an adorable teddy bear exudes soft, plush cuteness--sure to induce cheek-hurting smiles! What an utterly perfect gift! What a sweet array fo Butterfly Kisses! 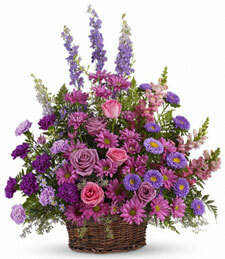 A touch of pink, a dash of lavender, and a pinch of yellow are the picture perfect recipe for success! 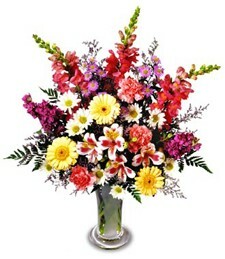 Touch their heart with a hint of floral fantasy in a dazzling colors that will set their senses in a frenzy. Now is the time to charm them from head to toe! 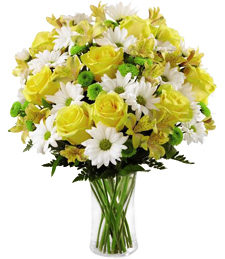 Highlight that country moment with a precious plethora of sunkissed blossoms in the shades of sunburst yellow and glistenting white. Take a sip of that Homemade Lemonade and wish upon a star for all those childhood dreams to come true! 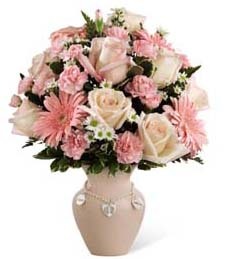 A vibrant assortment of fresh white flowers and hot pink roses radiates vivid beauty and lively charm! 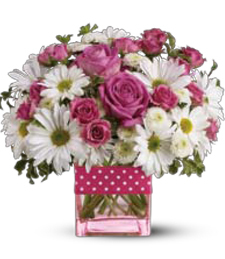 Set in a darling pink cube vase and tied off with a pink and white polka-dotted ribbon, this piece makes a truly delightful gift! 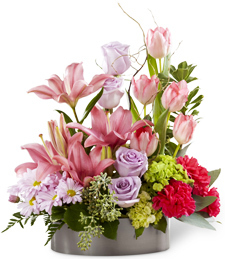 Embrace the gentle essence of spring and the many blessings of a new beginning ahead. 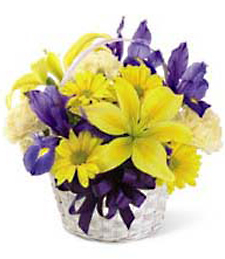 Dive into the realm of happiness with that special gift of lavish purple and sunkissed yellow fresh florals to set the occasion right. Good times are just around the corner! 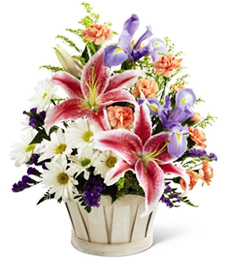 This stunning array of subtle yet beautiful flowers sparkles with nature's grace and charm. 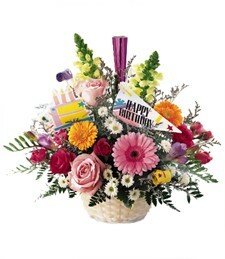 Breathtaking appeal and sweet floral scents ensure that these blooms will make a truly memorable gift!